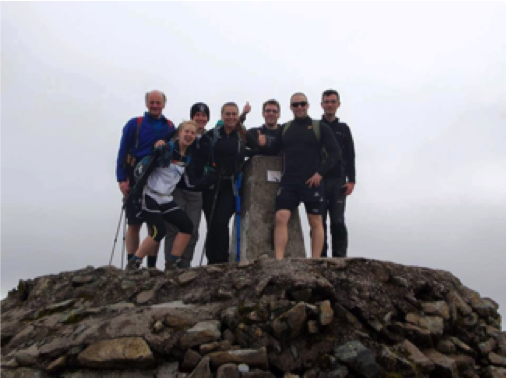 Back in May, seven Crisp staff members were persuaded to take part in the National Three Peaks Challenge (and raise lots of money for Challengers) and on 25th September, four members of the London office and three members of the Leeds office (Imogen, Sam, Coco, Ashleigh, Jordan, Cameron and James) set off to conquer Ben Nevis, Scafell Pike and Snowdon. Here’s our story. We travelled to Scotland on the eve of the challenge accompanied by our trusted driver, Rob. 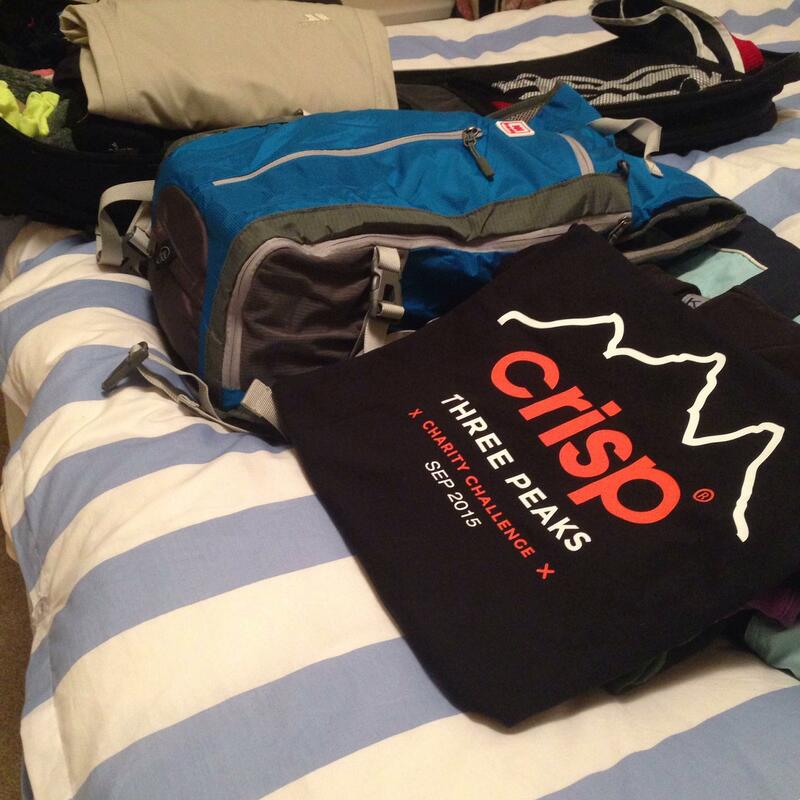 Once at the hotel, we made final preparations to our kit – we’d need one kit bag for each mountain to save time fumbling between peaks. We enjoyed a hefty meal in Weatherspoons that evening knowing it would be quite a while before we had hot food. We’d need to work together as a team on the mountain so the meal helped strengthen office bonds. After a poor night’s sleep in the airport hotel, porridge was the stodge of choice to set us up for Big Ben. First on our list was a completely different challenge, arguably requiring more mental strength – a super market sweep in the Fort William Morrisons. We dashed around buying supplies for the next 24hrs including at least 2L of water per mountain. The funny thing was, we could see Ben Nevis peeping through the clouds from Morrisons car park - it looked incredibly menacing and much taller than people had expected. Some thought we were climbing the wee hills in front of us! Our mountain guide Mike was already waiting for us at the base and once out the van, we had our first of three safety briefings. We thought how tempting the Ben Nevis Inn was where we could have easily spent the next 24hrs…! One team photo, one look at our watches and the challenge began at just past 11am. Mike set off on a quick pace, and poor Ashleigh forgot to take her 2nd mountain kit out of her rucksack so she was carrying a lot of extra weight! It was cloudy but cool and we lapped up the views of different lochs. As we climbed higher, we crossed waterfalls and could see Glen Coe which turns into a ski resort come winter. We made fun of Cameron for climbing in webbed slippers but that didn’t deter him especially after his caffeine and pre workout mix. The ONLY place you can do your business out of sight on Ben Nevis is behind a triangular rock half way up the mountain. Those brave enough to venture behind the rock said they would never be doing that again. Up we went, negotiating big steps and we were amazed at how many dogs were on the mountain – it could have easily been a Scruffts dog show! Soon nine hairpin bends and a rocky field was all that remained before we reached the summit. 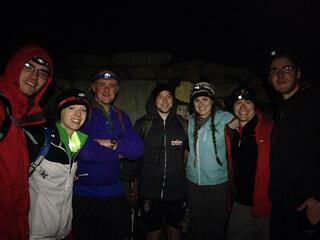 We were feeling confident, fresh-legged and excited to reach our first summit on the highest of all three mountains. Lots of people were queuing for photographic proof at the top and in the few minutes we had, we managed a team photo and wolfed down some food. Suddenly, Coco cracked out a bottle of Bell’s whisky from his rucksack. To the delight of the team we were all allowed a swig – one at each summit. The warmth of the whisky warmed us through to the core and made the three-hour descent ahead of us not feel so bad. The descent was hard on the knees and we now knew why it was advised to climb with poles. Once at the foot, we had ten minutes (which went in a flash) to grab mountain kit 2, go to the loo, change, and get back in the van for a five-hour drive to the Lake District. We would be burning a few thousand calories per mountain so refuelling was critical. Everyone was making sure to eat enough to have energy for the next mountain. Fortunately we had a services stop along the way where Sam bought a Whopper. Unfortunately for him, half ended up all over his walking trousers, which, by this point had documented the whole trip so far! Jordan was also documenting the trip on social and, not long into the trip, the expression ‘Peaks on Fleek’ seemed to stick… As the light faded, we attempted the super market trolley game. It was a pathetic attempt as we only managed five items - testimony to how tired we were. 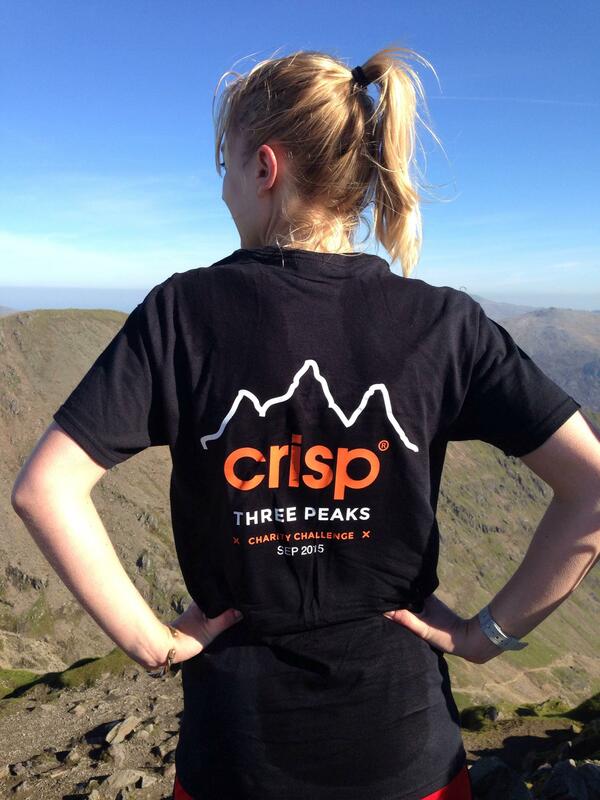 Little did we know how our bodies would cope with Scafell in the dark. Those dozing were soon woken by the rumbles of the cattle grids and swerves around sheep in the middle of the road. After our 15-minute warning, we assembled our kit, head torches etc. I handed out military grade light sticks to the team (Lara Croft style) to clip on the back of our rucksacks so we could keep track of each other on the mountain. 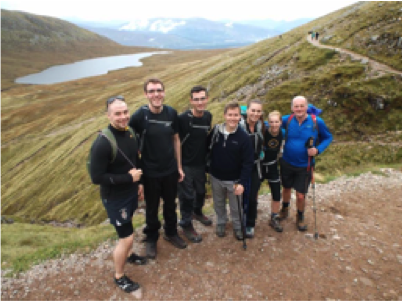 We would certainly have to channel our inner Lara Crofts to get up and down this one – I knew that from training, fatigue kicked in 5-6 hours later and this would be time we’d have to start walking again. We were sore and aching with the bulk of the challenge to go. The full moon and starlight welcomed us into the campsite at the foot of our second mountain. Luckily for us, they would significantly help light the way – so much so we wouldn’t need head torches for parts of the climb. We could see other groups’ head torches snaking down the mountain. Mountain guides Mark and Charlie were ready waiting for us. At this moment, it would have been great to play ACDC’s Back In Black on full blast for a bit of motivation, but we were in a campsite and had to be quiet… Immediately after our second safety briefing, we set off at 11pm. This now felt like a military operation – get up, get down and don’t give way to pain or tiredness. Cutting wind and a treacherous rock field met us at the summit. We couldn’t believe people were camping here! Some were really feeling it at this point and were dreading the way down for the sake of our aching limbs. Luckily for James, whisky and ibuprofen seemed to give him and others a new lease of life for the way down. We didn’t hang about. Whisky, team photo, food in face and we clambered down. Coming down was very hard on the knees and legs and 2hrs10 later, we had completed number two just after 3am. One of the guides said this climb was up there in his top 10 because of the brightness of the moon and I can’t imagine climbing this in the rain. A sheer sense of relief filled the group reaching the bottom knowing there was only one peak between us, and completing the challenge. Morale was high but our bodies were really feeling it. Once at the bottom, we had 10 minutes (which went in a flash) to grab our third mountain kit, go to the loo, change and bundle into the van. This time, it was far more chaotic because people had changed places. We felt like we were in a heist with kit, limbs and food everywhere bundling into our getaway vehicle. Go, go, go! Because we’d swapped around, all our stuff was everywhere so for the first 15m we were passing food, drink and kit between us. This was another challenge because we were mentally and physically drained. 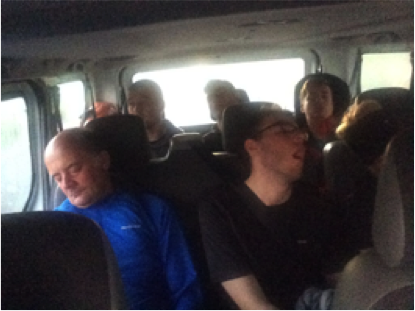 Group concerns at this point were 1) Refuelling on the winding roads of the Lake District 2) Trying not to be sick 3) Massaging body parts in agony 4) Sleeping to allow enough energy for the last mountain. Whilst Rob’s stem ginger biscuits helped keep sickness at bay, an emergency stop had to be made en route… After this, tiredness set in pretty quickly. We woke up to the Welsh countryside around 7:30am with disbelief that we’d made it this far. Our driver’s countdown warnings and prepping kit inside the van was now routine. As people were waking up, we couldn’t believe what a glorious day it was. We were really thankful to Rob who chose not to wake us up on the 5-hour drive to Wales because he'd bought us an extra 30 minutes on the mountain. The last climb would be tough enough without the added time pressure. 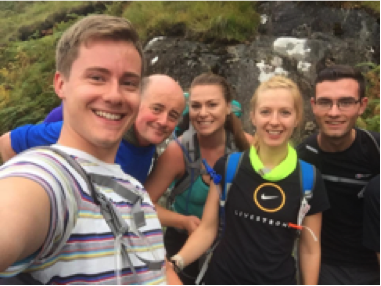 We met our last mountain leader (Rob) in Snowdon car park and had a luxurious 20 minutes to get our kit together, eat and warm up before we were on our way. One more team photo, one more safety briefing and we were off. If we kept one foot in front of the other, we would complete the challenge with time to spare! 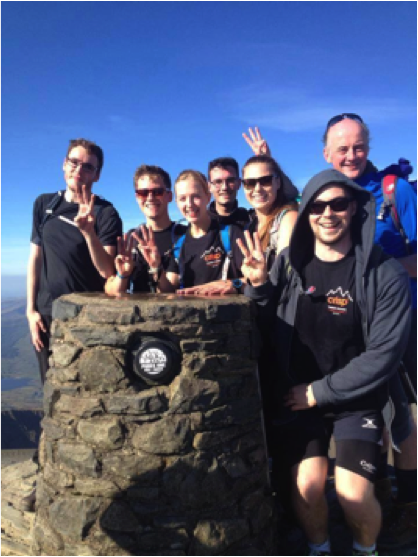 Could our legs really take us to the top of Wales’ highest peak after two of the other highest peaks in the UK? We were bloody well ready to see if they could! 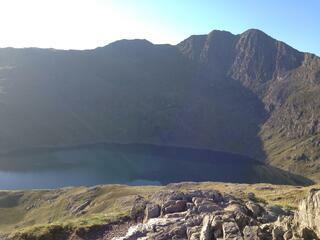 We started the last peak just after 8am and the views were spectacular. Green, sunshine, sparkling water, all welcome remedies for Scarred for life Pike! On this mountain we had a mixture of up and down for the first part which helped our legs to warm up. Every few minutes was a Kodak moment that we wanted to capture but we knew if we stopped for long, our legs would seize up and the summit would remain further out of reach. We had to keep focused at the task at hand, which was getting our arses up this mountain! The weather gave us a new lease of life and dare I say for parts of it, it felt like we hadn’t done the first two. 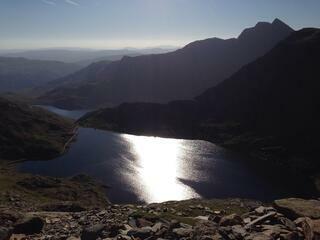 We passed other groups going up the mountain – apparently the same people who were on Scafell. We were obviously in better shape. The route was punctuated with our guide yelling ‘Get some fluid in ya…!’ We journeyed on. The views were stunning, yet again perfect conditions as we climbed higher. We could see marines training to our right on what looked like a jagged knife-edge (Crib Goch) not for the faint-hearted. When the mountain path opened out into a saddle, we could finally see the top. At this point we were both happy that we could see the final part of the climb and in despair at how much further was left. Our legs were really feeling it by now and the last third was extremely difficult. It required a huge amount of effort, large steps and focussing on the next thing in front, even if it was a sheep. We kept each other motivated and helped each other over rocks where we had to scramble on slanted slopes. We didn’t look left, which was a long way down, and now more than ever we had to channel our inner mountain goat. Once on the final leg, we were relieved to have more of a path to walk on. It suddenly got very windy but the adrenaline running through our bodies, accompanied by the warmth of the sunshine kept us from putting on the layers just yet. We were so pleased to get inside Snowdon’s café for drinks and food. As a reward, some of the team inhaled pasties the size of small cows. 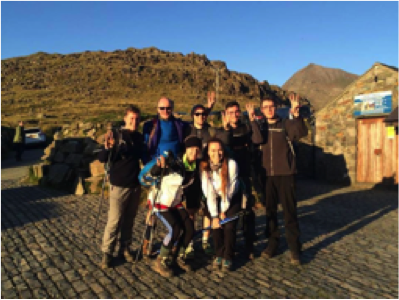 Then, some walked down, others took the train down to our hotel at the foot of Snowdon for beers and rest in the Welsh sunshine. Come dinnertime, we couldn’t string a sentence together and one week on, the challenge is only fully sinking in. 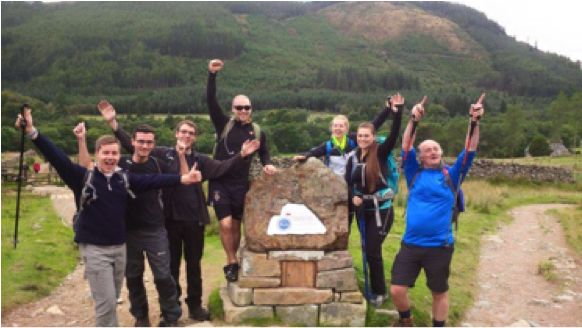 A special thank you to Advocate Events (Jo, Martyn and Rob) as well as our mountain guides (Mike, Mark, Charlie and Rob). We also wanted to thank Jack and Sophie from Challengers for helping us surpass our fundraising target of £6,650!